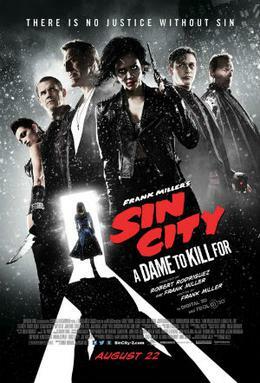 The sequel to 2005’s ‘Sin City’ is another similar trip into the noirish hell of Basin City, with another three main stories (and an intro) about crime, femme fatales and dangerous men. Stylistically, the film follows in the same vein of the original, with the use of green screen throughout to portray the look and feel of the comic book, and a few new characters join some of the key players from the first film. To be honest, the problem with the film is that it is simply inferior to the original effort, and the innovative style of the first film no longer feels innovative. That’s not to say I didn’t like the film – this is a good yarn and the scenery chewing performances are still pretty great, but it lacks the spark of the first film where everything felt fresh and original. I enjoyed all of the stories, perhaps ‘A Dame To Kill For’ the most, largely down to Eva Green’s mesmeric performance as Ava Lord, captivating every man that comes into contact with her, but the other stories were enjoyable too. The music is pretty great throughout, and the supporting cast is excellent fun (albeit a lot of the cast are given very little to do) – I particularly enjoyed a couple of ex-24 presidents in Powers Boothe and Dennis Haysbert, as well as former chief of staff Jude Ciccolella in prominent roles. Mickey Rourke and Eva Green are the overall standouts for me though. Robert Rodriguez’s last film was the mediocre sequel to ‘Machete’, and this further sequel (and lack of success going by the initial US box office takings) will hopefully help return Rodriguez to developing original movies again. Ultimately, if you liked the first film (which I did), I suspect you’ll get a lot out of this even if it’s not on the same level. Overall, I thought this was a pretty good film that leads off the positives from the first film to tell new stories in the same world, albeit it lacks the originality and panache that the first film had when it came out.